You’ve probably heard of the whole hair-envy thing that goes around — women with curly hair wish for straight hair, and vice versa. Of course, the problem can easily be fixed with simple appliances that usually involve heat, such as the curling iron I actually got today.1 Which is what prompted me to wonder about the science behind hair curls. While it’s quite clear that there seems to be a genetic component to hair curliness, since the type of hair texture often runs in the family to a great extent, what particular chemical and physical mechanism determines whether hair is straight or curly? It seems that to find the answer, we literally have to go to the roots. Each hair is basically a long chain of keratin filaments that grows out of hair-producing organs in the skin called follicles. 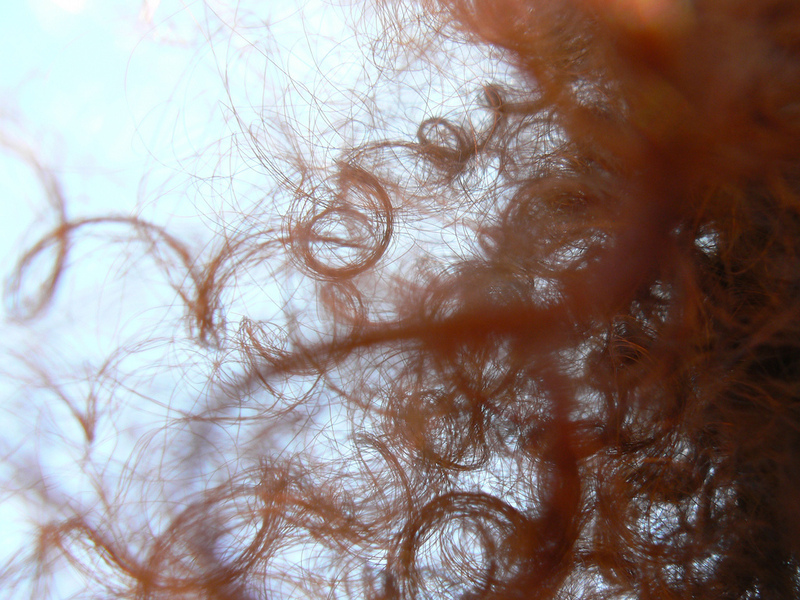 These follicles can vary in shape and size — a 2003 study done by researchers for L’Oreal found that the shape of curly hair is influenced by the flattened or oval shape of the hair follicle that results in an oval cross-section of the hair shaft; also at play is the sharper angle in which hair emerges from the scalp. Straight hair, on the other hand, grows from round follicles and comes out of the scalp at a more flattened angle. This is a chemical crosslink that ties the adjacent keratin strands together. A high proportion of disulfide bonds twist the hair strand into a helical pattern. Adjacent hair strands tend to assume the same pattern, and then cluster together into multi-helical structures that form curls. In this manner, the nanoscopic structure is repeated at the macroscopic level. Nature loves patterns. Hence it is pretty clear that the built-in nature of your hair can’t be changed, since it’s buried way down in the molecular level. However, as is well known, it can be manipulated by applying heat, which messes with another type of bond between the keratin strands, the hydrogen bond; this bond is temporary and is affected every time hair is exposed to water or heat. Makes me want to steal curly haired friends hair and examine it under different magnifications.